Dental Cure & Care Centre is a premium dental care facility in heart of Noida. Located on the out skirts in sector 50, it caters to dental treatment needs of patients from neighboring and far off locations in Delhi/NCR.The clinic has state of art treatment facilities offering care at international standards. With dentists (Dr. Santosh Mishra & Dr. Madhu Shweta Mishra) having a vast experience in dentistry, Dental Cure & Care Centre provides an efficient, effective & equitable dental care to all patients. Our motto is to provide Peace of Mind & complete Dental Solutions to you with our highest quality dentistry, using the most up to date skills and the finest materials available. Dental Cure & Care Centre is led by Dr. Santosh Mishra & Dr. Madhu Shweta Mishra who are dynamic, highly skilled and experienced. Dental Cure & Care Centre offers a wide variety of general and specialist dental treatments. All of our treatments are available under one roof whichever specialist you may need to see. No more than 6 months after first tooth is emitted. There is a critical quality for right on time well child dental checkups. The treatment technique is a feasible choice for grown-ups, kids and youngsters. It can revise various normal dental issues, improve your grin and help your respect toward oneself. A Denture is a situated of replacement teeth that dental specialists prescribe when you are forgetting a few or all your teeth. The greatest focal point of Dentures being you can recover your life to ordinary. Crown and bridge treatment method can regain dropped enamel & assistance left over enamel. If you faced tooth loss, Crown and Bridge treatment may be the right restorative option for you. Root Canal Treatment falls under Endodontics a specialty area of Dentistry. Many people experience major pain with their teeth stems from damage or injury to the soft tissue portion of the tooth called the pulp. In modern-day dental treatment, dental fillings include a couple main requirements: to stop the particular progression of cavities in the teeth, and retain natural look for those teeth. A Dental Implant is an artificial tooth that is submitted into your jaw in request to hold a substitution tooth or extension in instances of any loss of teeth because of any periodontal ailment, harm or different reasons. The Bleaching method is effective on most stained teeth. Darker stains, for example, those brought about by anti-infection agents are harder to whiten. Gum diseases alludes to irritation of the delicate tissue (gingiva) and strange loss of bone that encompasses the teeth and holds them set up. 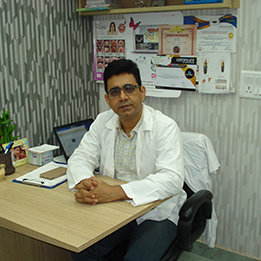 Dr. Santhosh Mishra, Sr.Dental surgeon and Dental Implantologist at Dental Cure & Care Centre has an experience of 20 years in the field of dentistry. He completed BDS in 1998.He is a member of Indian Dental Association. Some of the services provided by the doctor are: BPS Dentures Fixing,Cosmetic/ Aesthetic Dentistry,Complete/Partial Dentures Fixing and Impaction / Impacted Tooth Extraction etc. 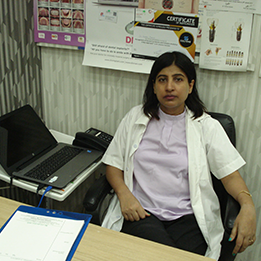 Dr Madhu Shweta Mishra is an experienced dentist with 20 years of experience and has specialization area in Crowns & Bridges, Dentures and R.C.T. She is a member of Indian Dental Association. Some of the services provided by the doctor are: BPS Dentures Fixing,Cosmetic/ Aesthetic Dentistry,Complete/Partial Dentures Fixing and Impaction / Impacted Tooth Extraction etc. Dr Santosh Mishra is a highly experienced & caring doctor. My Mother got Dental treatment from him last month & she is very much happy about the service & the care taken by him. Will surely recommend all my relatives, friends and neighbours to visit him for any kind of Dental Problem/ check up. A Really Great Experience! I Got My Dentures By Dr.Santosh , he is really experienced and friendly. I Would recommend it to everyone who reads it! Probably the best dentist n clinic I've ever visited! Hello Dr. Madhu, this is Mrs Shrikents daughter. Thank you very much for a job very well done. I was down with a migraine so I could not express my gratitude for being kind and gentle with my mother. She is thrilled and has not taken her dentures off for a moment. I will urge her to follow procedures. Once again thank you very much and I wish you and your family a splendid 2019. Shop no. 7, B-1, Central Market, above Gopala Sweets, behind Rail Nagar, Sector - 50, Noida (U.P) – 201301 India. C-1/9, Sector - 31, Inside Corporation Bank Building, Noida (U.P) – 201301 India. LGF -16 Mahagun Mart, Sector – 78, Noida (U.P).